This photographic shot was taken in the evening while we enjoyed a Luau on Oahu, Hawaii. 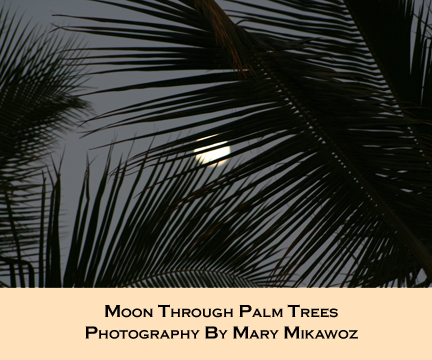 The moon is almost hidden by the palm trees even though it is fully in the sky. Who doesn’t like a full moon? There is something spectacular in seeing the whole moon light up the night sky. One of the most amazing things for me is the way the lunar appearance affects entire oceans with ensuring the pull and withdrawal of the waters surf.